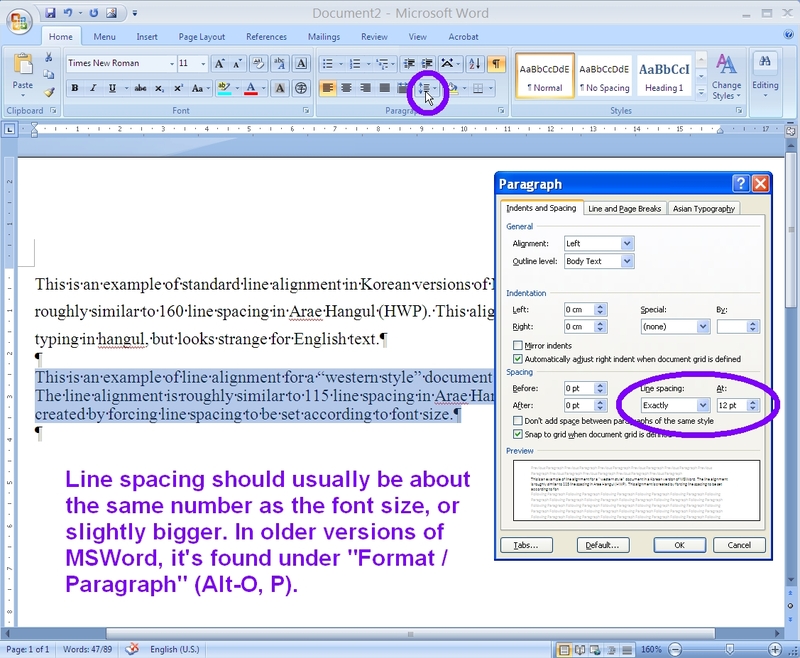 MS Word's line spacing can be a headache if you are using a Korean version of MSWord to prepare a document in English. With the new "ribbon style" design in Word 2010 and later, it's a little bit easier to find line formatting. Does this help? Highlight the text you want to adjust (CTRL-A highlights ALL text), click the linespace icon in the Home section of the ribbon menus, and the paragraph format box will open. Select "Exactly" or "At Least" and then a line spacing number the same as or slightly larger than your font size. In older version of MSWord, click ALT-o then P to get the "Format/Paragraphs" formatting dialogue. You can also "right-click" after you have highlighted and get a simplified menu.